Kamtchia complex is situated on the mouth of the river having the same name, situated in the exotic Nature. It is 25 km far away from the town of Varna and 5 km from the highway Varna - Istanbul. The climate is pleasant,the average temperature in the summer is 25 C-32 C. The summer season starts at the end of May and finishes at the end of September. The Rai complex comprises 35 villas of Alpine type. There are some restaurants, cafes, a discotheque and many other places for Entertainment. The holiday village disposes of one- and two-storey villas and bungalows. Villas “Finlandia” are two-storey villas in Alpine style. The first floor consists of a sitting room, dining room equipped with kitchen with cooker, refrigerators and utensils, WC with shower cabin, verandah. The second floor comprises two double bedrooms. Villas “Kamchia” are one-storey villas and include 2 double bedrooms, a sitting room, kitchen unit equipped with a cooker, refrigerator and utensils, WC with shower cabin. Bungalows “Italia” consist of 1 double room, WC and bath with shower, small verandah. There are 225 bungalow / 2-star / with a double room and a bathroom. Also there are offered: breakfast, lunch, dinner, safe at the reception desk, organized excursions. 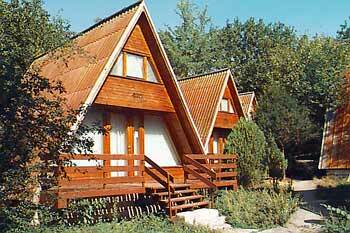 We wish you a pleasant stay in Kamtchia resort.